Keeping Big Band Music Alive! In April of 1984, Mickey Roeberg took his first step towards fulfilling his dream of playing saxophone in a big band. Mickey, along with a number of other big band enthusiasts created a fundraiser for the Exeter Association of Parents and Teachers based on the life of Glenn Miller. Five saxophonists, four trumpeters, four trombonists, one bassist, a guitarist and a pianist joined together for the one-shot big band production. 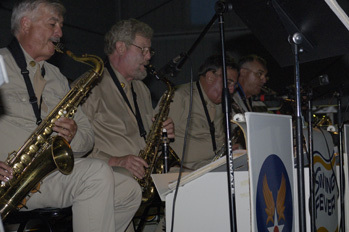 The show was called “Swing Fever” and was such a success that the all-volunteer members decided to build on their 10-song repertoire and formed the Swing Fever Dance Band. On October 1, 1989 the band became a non-profit corporation with the purpose of performing and encouraging the enjoyment of big band music. Over the years, as the interest in ballroom dancing and big band music increased, the band grew with it. The public’s desire for the warm, natural sounds of a dance orchestra offered numerous opportunities for the band to play. Charitable and public-service performances grew into private parties, wedding receptions and anniversary celebrations. In 1991, the Swing Fever Dance Band was officially proclaimed as Berks County’s official swing band. In 1992, the band performed in England and Wales. They returned in 1994 to participate in the United Kingdom’s official commemoration of the 50th anniversary of D-Day. 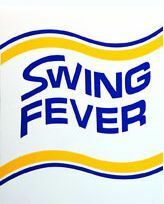 In 1993, Swing Fever Dance Band produced their first CD. “Wings to Victory” is a tribute to the music of WWII. The CD includes Glenn Miller’s American Patrol and In the Mood, Artie Shaw’s Back Bay Shuffle, and other great standards such as Boogie Woogie Bugle Boy, and I’ll Be Seeing You. A second CD was produced in 2003; “Something to Swing About,” which includes Take the A-Train, Eager Beaver, Moonlight in Vermont, The Shadow of Your Smile and many other great selections. Today Swing Fever Dance Band continues to entertain audiences in the tradition of the big bands.